Enter some info to get a $2/1 Any Gold n' Plump Chicken coupon. This could easily mean FREE chicken!! The first coupon is for .75/1, click on the one under that! note: you can only print one. 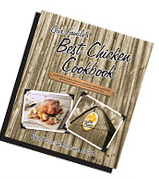 Remember you can also get a FREE cookbook when you purchase 3 packages of Gold n' Plump Chicken.